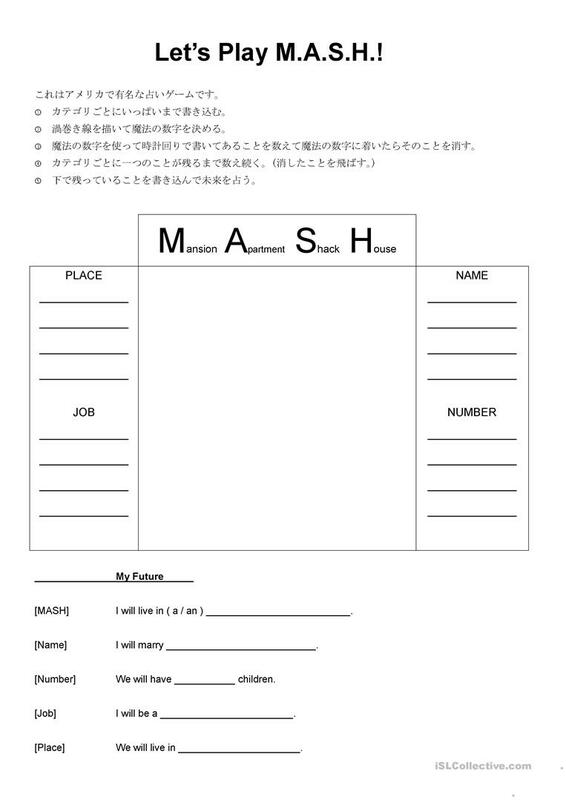 A worksheet for Japanese students to learn to play MASH. "MASH" stands for Mansion, Apartment, Shack, House. 1) Students fill in the categories. 2) A partner begins drawing a swirl in the center box. 3) The other student says "stop" and then the lines on the swirl are counted to decide the "magic number". 4) Using the magic number, count each item throughout all the categories, clock-wise. 5) Each time you reach the magic number, cross off that item. First, I explain the meaning of each word in the title. Then, demonstrate the game on the board. The instructions are also written in Japanese at the top for easier understanding. Students play the game in pairs. After playing the game, they plug in their results into the blanks at the bottom. You can then have them stand and read their "future" to the class. This downloadable teaching material is meant for high school students at Pre-intermediate (A2) level. It is valuable for practising Nouns in English, and can be used for developing your class' Reading skills. mooncrisis is from/lives in Japan and has been a member of iSLCollective since 2013-02-12 14:39:27. mooncrisis last logged in on 2013-11-06 01:09:21, and has shared 1 resources on iSLCollective so far.